Fresh off his own self-titled mini series during Annihilation, the gunslinging human Star-Lord and his galactic running buddies are back to protect the cosmos from a shadowy threat in this, their own self-titled ongoing series. I found the aforementioned Annihilation: Conquest – Star-Lord series to be good fun, and while a majority of the squad has returned for this spin-off, they're in the hands of an entirely new creative team so there's reason for a bit of uncertainty. Fortunately, Dan Abnett & Andy Lanning have remained true to the tone that Keith Giffen had written into the original mini-series. This is an adventure title, mixed with healthy doses of action and good humor, and while it occasionally gets a little carried away, much of its appeal lies in those moments of excess. It tests the limits of what its readers should be willing to accept in the name of a good taste, maybe pushes them a bit beyond that level of tolerance, and then reins it all back in with a well-timed pun or sudden, unexpected resolution. I won't lie, there are moments in this issue where you'll roll your eyes and think "I can't believe they're trying this," but when it's all said and done, you'll look back and relish the ride. Abnett and Lanning have also done a nice job of tying in several minor plot points and characters from the enormous Annihilation saga. That serves to give the series a ready-made backstory and a deeper, more diverse cast than most new titles ever get to enjoy. The duo even ties in a few pleasant surprises for readers familiar with the wealth of books that came before, which makes the experience quite rewarding. When you see Cosmo, the space-faring canine from a few issues of Nova, you'll think "Hey, I know him..."
Yes, there's a talking dog. He's wearing an old Russian cosmonaut's helmet. There's a talking raccoon with a hand cannon, too, but surprisingly enough neither feels overly cutesy or cartoonish. What's more, they're absolutely vital to the team, who would be little more than just another gathering of grim, stone-faced superheroes without them. This new team of Guardians offers a great balance between the serious, the certain and the ridiculous, and in the end that combination is what keeps the book so interesting. Paul Pelletier picks up the artistic duties relinquished by Timothy Green II, and approaches the book a bit differently than his predecessor. Where Green lavished the mini-series with a rich, hyper-detailed style in the same vein as Travis Charest, Pelletier's work is very close to the lighter, more expressive work of Mark Bagley. Actually, his stuff is so akin to Bagley's that when I opened up the first page, I was surprised to find his name absent from the credits. Which isn't necessarily a bad thing – I've long been a fan of the man's work, and Pelletier's rendition of it is a loyal homage – it's just a little unsettling at first. Despite his obvious inspirations, Pelletier's artwork is quite strong overall, and makes a fine match for the fast paced, popcorn-stuffing flavor of the story. When Abnett and Lanning are playing up the tension in the moments before a large battle, Paul is right there with them, absorbed in the moment and delivering the appropriate atmosphere. When the story takes a serious turn, he changes the mood to match. When it needs humor, he's on top of it. He's a great fit for the sudden, repeated changes of tone that the plot requires. While I'm worried by the more serious, generic bits of foreshadowing that are strewn throughout this issue, as a standalone tale I really enjoyed this issue. 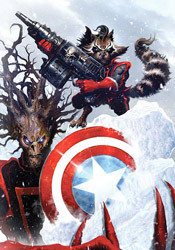 Guardians of the Galaxy never does what you expect, and proves to be a refreshingly different read. Its strange pace and sudden, jarring changes in style mean that it's probably not for everyone, but it's worth a borrow anyway to see if it connects with you in the same way it did for me.